“It’s delightful. It’s delicious. It’s de-lovely.” Cole Porter’s own words from another of his musicals perfectly describe Barrington Stage’s (BSC) production of “Kiss Me, Kate.” Let’s bring on the adjectives...it’s energetic, playful, and endearing. BSC has set its own benchmark so high in producing musicals that it has the difficult task of, at the very least, reaching the mark. At best, exceeding it. Exceed, they do as BSC literally jumps into its 20th season with the first of “Kate’s” memorable songs; “Another Op’nin, Another Show.” The show? “Kate” is a play within a play where backstage problems and personalities come center stage. “Kate” mingles Shakespeare’s “Taming of the Shrew” with a post-WWII city-to-city pit-stop theatre company. It’s The Bard meets Damon Runyon. And, it’s two love stories. Nearly all of Porter’s 18 songs are familiar (the sweet “So In Love,” the comic “I Hate Men,” and the rousing “From This Moment On”). It would be difficult for any audience member not to leave the house humming a medley. Porter’s lyrics are full of double entendres and farce, and are sometimes ridiculously funny. “Brush Up Your Shakespeare” falls into all three categories. 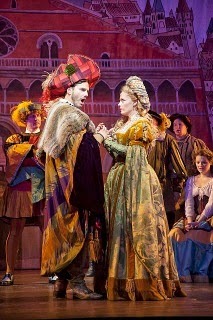 Elizabeth Stanley and Paul Anthony Stewart portray squabbling exes behind the play’s curtain and Kate and Petruchio on the stage within the stage in front of the curtain. Got that? It doesn’t matter. What matters most is the truth and humor they give to their characters in their private moments and interactions with each other. Bravado and ego abound -- loudly, relentlessly, and hysterically. Oftentimes, theatres hire actors who can sing, or singers who can act. There is a difference. Rarely are the skills equal. Stanley and Stewart make for a perfect match. Stanley’s soprano voice is almost operatic. Stewart holds onto his songs with passion. The pit orchestra -- yes, they are really in a pit with dancers jumping and spinning in precarious moves within inches of the players’ heads -- makes 12 musicians sound like 25. Joe Calarco’s direction and Lorin Latarro’s choreography are as in synch as their lead actors and the two plays. “Too Darn Hot” opens Act II as the entire ensemble mixes jazz, ballet, and modern dance into a sultry, sweaty, and steamy showstopper. And the costumes…the sets…Just get ye' to Pittsfield. For a story about intimate connections and lost love, “Ghost-The Musical’s deepest impact comes courtesy of its grand, broad, cutting edge visual gestures. For instance, as befits a musical whose source material is a movie, “Ghost” features its own opening credits sequence. With book by original screenwriter Bruce Joel Rubin, Sam and Molly are young, successful and in love, until tragedy strikes (see the title). Sam must bring closure to his life and their love, while protecting Molly and dealing with his initially powerless state. Like another recent movie-inspired musical, “Flashdance,” “Ghost” relies on high definition video projection and intense lighting to create a show that is part play, part rock concert. Unlike that show, the effects are used for more than just scenery. Unique stage magic tricks and creative blocking serve to create an otherworldly environment in a surprisingly organic way. A subway sequence is especially cinematic; combining fast paced set changes with unique physical movement, shifting perspective at lighting speed. The choreography by Ashley Wallen, too, is inventive and unique, ably served by the ensemble. Slow motion, freeze frames, and fast reversals of direction serve to underscore the ebb and flow of the rhythms of life. The creators have wisely chosen not cast doppelgangers for the film’s original stars, and letting the performers bring more original portrayals of tenderness and longing. The role of suddenly relevant psychic Oda Mae Brown could easily go over the top, but Carla R. Stewart plays the comedy with a deft and realistic touch. Her big production number “I’m Outta Here,” as well as Katie Postotnik’s (Molly) plaintive “With You” were stand outs among the rock/pop score. Iconic moments from the film, such as the pottery wheel and “Unchained Melody” are present, but woven in more subtly than one would have expected. This helps to make “Ghost-The Musical” a unique companion to the film. The sights and sounds will wow your senses, but the story will still touch your heart.